I WRITE concerning Camden Council’s spectacularly stupid decision to force Edith Neville School to share the already cramped facilities on the small space it possesses with Frank Barnes School for the Deaf. This increasingly incompetent Lib Dem and Conservative council has disgracefully written to the parents of Edith Neville saying that unless they accept Frank Barnes on the site there will be no money for a very necessary new build. Edith Neville is a “temporary” prefabricated building built more than 35 years ago. It needed new build in 1987 when the Tories failed its children. 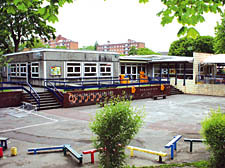 It needed a new build in 1997, when Labour failed its children. Now, the Lib Dems and Tories are failing the children of Edith Neville by back-of-the-envelope policy-making. These bully-boy tactics are all too typical of Camden Council. The creation of Children, Schools and Families department was a botched job. Too great a priority was placed on social services. It was insufficient on early years provision and there was precious little on primary or secondary education. It is a Lernaean Hydra waiting to implode. Children, Schools and Families is dull, unimaginitive and short-termist. It is incapable of strategic thinking or forward planning. A secondary school in the south of the borough has been predictable for a decade, as has Edith Neville’s need for new build. Frank Barnes has its own dedicated site – and it loses it to an unnecessary academy in the north of Camden. Frank Barnes rejects its first offer of a site and Edith Neville is targeted by policing-making on the hoof. I have three sons at Edith Neville, aged four, six and ten. I consider it one of the best schools in the borough. Sean O’Regan, the headteacher, is a brilliant inspirer of children, staff and parents. Its staff are a talented and highly competent team aimed at integrating all children into every facet of school life. Its children are happy to return after the shortest of breaks. The school is targeted by local racist vandals. The first day my oldest son went to school, a local-born “son and daughters” racist said to him: “Edith Neville! Oh, you don’t want to go there! Only the scum go there!” My wife and I had to explain to a five-year-old on his way to school that “scum” comes from the French écume – the froth on the top of the wave, it always rises to the top. The children of Edith Neville have been treated like “scum” for a whole generation. Camden has allowed its children to fester in substandard facilities for years. There are alternatives. A lot of space exists at Maria Fidelis when it moves to Upper Gower Street. There have been other offers to Frank Barnes. There is always the possibility that Frank Barnes or Edith Neville will be offered the nearby site across the canal from Camley Nature Reserve for a two-entry primary school. But I suspect that Camden, with its social engineering agenda, would not want either Frank Barnes or Edith Neville School for the chi-chi children of the £500,000-plus homes to be built on the King’s Cross Railway Lands. Personally, I believe the governors and parents of Edith Neville should give serious consideration to becoming a foundation trust primary school. Leave Camden’s dysfunctional children, schools and families and seek direct funding from Whitehall. Some witless person thought nothing of lumping deprived, disabled children with deprived children from a wide range of ethnic minorities. Both Boris Johnson and David Cameron will be appalled at Camden education chief Andrew Mennear’s paltry failure to stand up to the Lib Dems or the officers. Mennear proves that Tories will be dismissive of the needs of ethnic minority children and children with disabilities. Mennear show that Tories are not to be trusted with education at any level of government. This moronic decision shows that Lib Dems are not fit for purpose at any level of government. Some years ago I wrote to the New Journal saying that the Fleet River should be redirected to cleanse the Augean stables of Judd Street. A helpful Conservative reader pointed out that the Fleet River was now a sewer. At the last local elections Camden voters swept out the ultra-Blairite administration bequeathed by Dame Jane Roberts in a total rejection of Blairite policies. Unfortunately, the now jaded Lib Dem/Tory administration has failed to cleanse the incompetent and clueless at directorate level. This failure led to the continued pursuit of discredited policies. It would seem the Fleet River still swills around, fetid, at policy-making levels of housing, education and other desultory levels of the council. Camden has more than enough sites to accommodate the needs of Frank Barnes so that it has its own dedicated building and play space. The Lib Dems and their Tory side-kicks are failing the children of Camden and Camden’s future properity. Shame on you all.